In this post, we will see about CyclicBarrier in java. CyclicBarrier was introduced in Java 5 with other concurrency utils such as CountDownLatch, ConcurrentHashMap and BlockingQueue. CyclicBarrier is synchronized aid which allows set of threads to wait for each other at common barrier points.It is called cyclic because it can be reused once waiting threads are released. 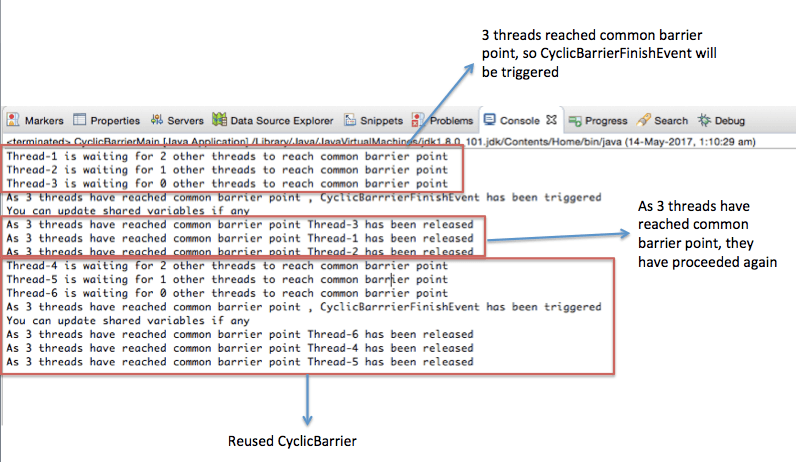 Let’s say you have 3 threads, you want all threads(terms as parties) to reach a common point and then only they should proceed ahead.In this case, you can use CyclicBarrier with 3 parties and once 3 threads reach a common point, you can call an event which will implement runnable interface and Three threads will be released. The major difference between CyclicBarrier and CoundDownLatch is that CyclicBarrier can be reused.You can not use CountDownLatch once used. You can read more differences between CountDownLatch and CyclicBarrier. System.out.println("As "+cyclicBarrier.getParties()+ " threads have reached common barrier point "
This is a Runnable task which will be executed by each thread. System.out.println("As 3 threads have reached common barrier point "
CyclicBarrierFinishEvent will be called when 3 parties (Initialized with CyclicBarrier object) reaches to a common barrier point. Below diagram will make you understand output better. That’s all about Java CyclicBarrier example.